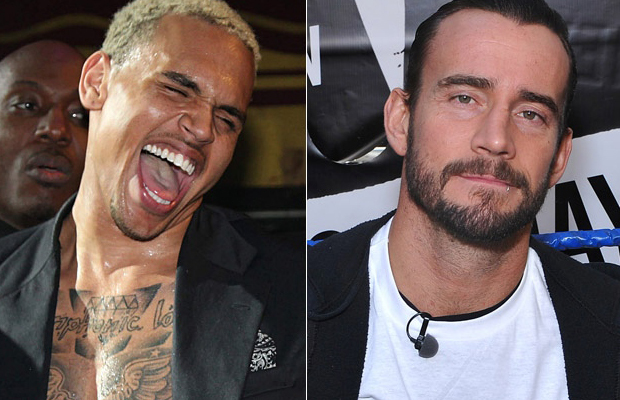 By now, everyone has been keeping tabs on the recent Twitter war between WWE Heavyweight Champ CM Punk and singer Chris Brown. The wrestler spoke his clout on Brown’s physical abuse on former girlfriend Rihanna and Brown retorted by proclaiming Punk was a serious roider. You can check out the tweets here. It didn’t take Punk long to issue a challenge to Brown, posting a Twitvid clip welcoming the Grammy winner to a one-on-one match. Punk defends himself in the video stating he’s a “proud drug-free straight-edge individual,” while throwing a few poisonous darts at Brown saying, “picking up trash on the side of a highway does not make amends for repeatedly striking a woman in the face and sending her a hospital.” Well said. Watch the entire clip below. Chris…take it from us…you don’t want none.